Creativity is one of the essential things for a modern workplace environment, but the creative process is not necessarily natural for everyone. There are things you as the team leader can do to make creativity a larger priority and an encouraged trait in your team environment. When you can form a team environment where creativity is given a priority, you’ll find that employees are more satisfied with the work they’re doing. You might also see your company becoming more competitive as you and your team find new solutions rather than doing the same things over and over. Creativity is necessary in all work places. While it might not seem like an asset in some of the more mundane areas of work, there are undoubtedly some creative solutions which could impact even those working activities as well. A good, creative solution makes the same work easier or does some other business activity in a new, more effective manner. 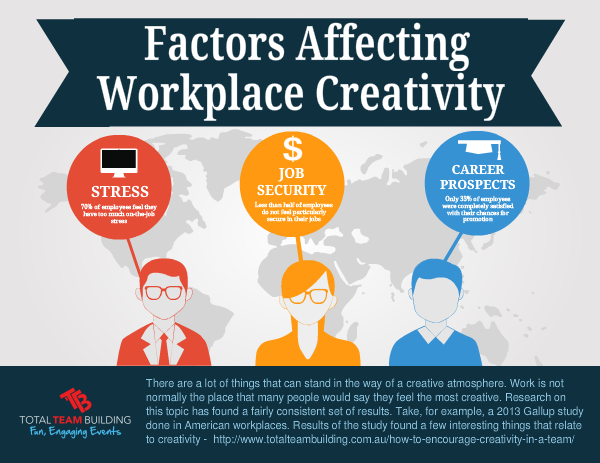 All of these factors tie into workplace creativity in one way or another. Excessive levels of stress at work will make employees shut down and do their best, but it won’t encourage creative thinking. Stress sometimes causes people to work harder, but too much stress reduces productivity and kills creativity entirely. Job security is necessary if employees are to come up with creative ideas for the business. If any employee does not feel secure in their job, they will be completely unwilling to take risks. Creative ideas almost always require some level of risk. When there is a chance of an employee being replaced, their top priority becomes doing their regular work, not coming up with new and risky ideas that might lose them their job. Without the powerful motivational force that is a chance at improving yourself, most employees will be less willing to put in the time and effort to be creative. Creativity can be hard, and it might take a long process to get the best ideas and start implementing them. If there is no way to move up from their current position to a better place in the future, few employees are going to be willing to put in that kind of time and effort. The creative mind does not always offer the best solutions on the first try. Sometimes it takes a dozen silly ideas before one fantastic idea can emerge. If this is the case, it’s important that you don’t criticize the flow of ideas coming from your team. 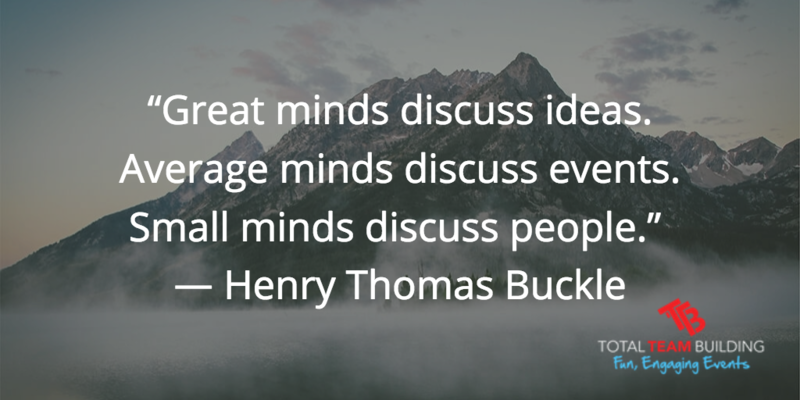 You may decline to implement them, but do not down-talk employees for their ideas or negatively criticize their way of thinking about an issue. Rewarding creative solutions and good ideas is a sure way to make others more interested in being creative. If employees see their fellow team members getting a desirable reward they might become more interested in earning on for themselves by contributing creative ideas. Some ideas for rewards are public recognition, acknowledgement of a good job done, small monetary compensation (gift cards or sometime similarly inexpensive), a personal trophy of any type, or a thank you card signed by employees and management. Don’t spend all your working hours doing normal working activities. Make sure your team does at least a few hours of creative thinking and idea generation each week to break up the monotony. This includes activities like brainstorming/brainwriting, problem solving, or any other methods that you find are effective for your unique team. Focus on what works for those individuals. If you force an idea generation task that people hate, you are not likely to get good results from the time spent. It’s been shown that open working spaces make employees more collaborative and overall more creative. Collaboration can usually lead to creativity, as diverse minds working together can come up with their own unique solutions to the same problems. If your team works in their own individual cubicles or stays in a cluttered up office space, try to open it up and make it a clean, relaxing environment where people feel more at ease and closer together. Giving employees a sense of closeness to one another is a great way to encourage them to be creative. If you are the team manager or the leader, you need to also contribute to the creative process. Yes, it’s good to allow your employees the chance to shine and to take the lead, but that doesn’t excuse you from also participating in these creative activities. Lead by example if you want to have a more permanent impact on your team members. Just as you’re looking to encourage creativity, you will also need to be creative in how you apply the above steps. Depending on your unique team, you may or may not be able to continue doing the same things and expecting new results. Over time, you creative processes may need to change in order for new creative ideas to be formed. Don’t be afraid to use your own creativity as a leader and come up with a new way to draw new ideas from your team! 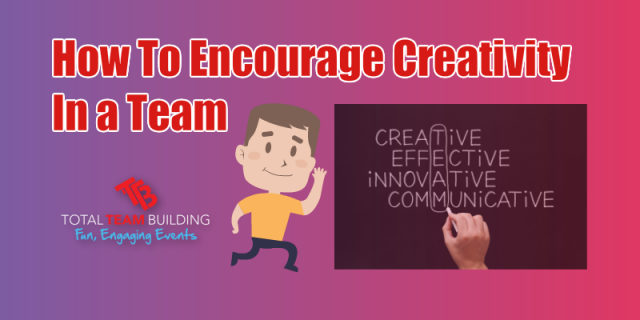 Have you ever thought of doing a creative based team building event? Total Team Building specialise in teams…we facilitate a range of creativity and innovation based team building activities such as bridging the gap, raw canvas and let’s get cooking designed to enhance your employees creative side. For more information about how Total Team Building can help you contact us today. Learning through failure is a tricky topic in business. Arguments can be made for and against this type of learning in a business environment. Let’s take a look at both sides of the coin and see what can be gained or lost from learning through failure, and how to implement a failure-tolerant culture in your business. What Is The Purpose Of Failure In Business? 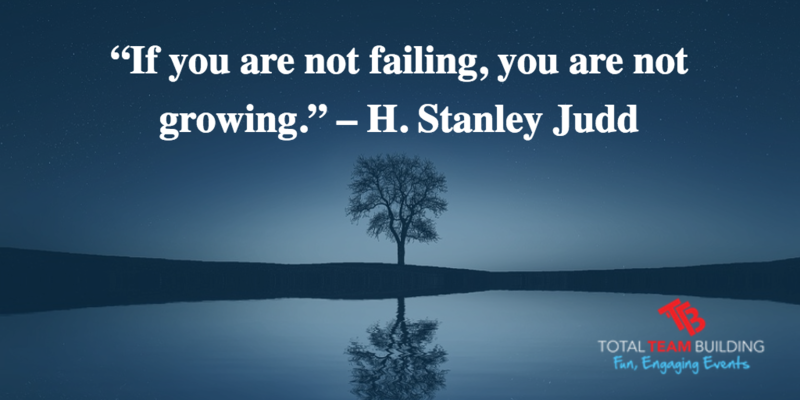 Failure is a great teacher. It helps us to see a personal example of what not to do and to learn more quickly than we otherwise would have. In organizations where employees are not allowed to fail at any point, fewer risks are taken and people tend to stay within their comfort zones. In certain industries this may be okay, but in most modern businesses risks are necessary for the company to stay competitive. If employees are not allowed to make mistakes or to fail at anything, they will be unwilling to try new ways of working that would possibly make the business more competitive. These are a few of the ways your business can thrive in a failure-accepting culture and some of the risks of allowing employees to fail. It is the leader’s responsibility to make sure employees cannot cause catastrophic damage to the business when they fail. This means that you will have to limit the areas in which your employees are allowed to take certain types of risks. Big risks shouldn’t ever happen in client relations or general corporate actions without executive leadership being involved to advice and implement. On the other hand, team projects and individual projects are usually a good place to encourage your team to take some risks and try new strategies to get the work done more effectively. If they fail in these areas, the team will be there to assist in fixing that mistake and finding a new way to accomplish the task. As a general rule for your team, it’s a good idea not to allow employees to take large risks on projects that could end up causing irreparable damage or being too costly to the company if a mistake did occur. Smaller projects are a great place for risks, as the damages caused are usually fixable and not very costly to the company. It’s okay for employees to make mistakes; we now know this. However, you shouldn’t allow employees to make the same mistakes twice. It’s acceptable to make a mistake, but it’s expected that failure should cause that employee to learn and to avoid making that same mistake again. If that learning does not occur, there will be problems in allowing that employee to take risks again. Ideally you should encourage this cycle with risk-taking: learn from, own, fix, and safeguard. This means that employees should learn from any mistakes they make, own up to what they did wrong, fix the consequences of their failure, and put in proper safeguards to ensure that mistake does not get repeated. This is a great guideline for employees about the best process for learning through failure. As a leader, you will have to learn how to supervise what your employees are doing without stepping in to intervene if you think they are wrong. Again, this applies only to the situations in which risk is acceptable and allowed, not in more risk adverse situations. If your employees come to you for advice on the matter, you can intervene then and show them the problems you have seen. Otherwise, exercise restraint and allow that employee to fail if necessary in order to allow them to learn from their mistakes. 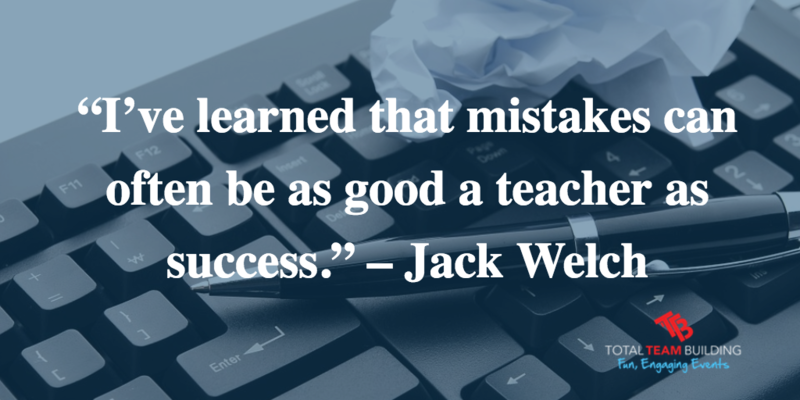 It’s important to differentiate between encouraging mistakes and allowing mistakes. You should make it known that mistakes happen to everyone and are acceptable, but that it is not encouraged to make mistakes. Instead, encourage employees to stretch themselves, try new options, and take risks in their work where it is acceptable. If these actions result in failure, so be it. If you want to create an environment where employees are able to learn from their failures, you must be willing to communicate this to them directly. Before people will be willing to stretch themselves and take risks, they have to know it’s acceptable and won’t be punished. Lay out the guidelines you decide on, challenge your employees to take risks, and stay true to your word on your stance about failure in the business. Total Team Building specialise in teams…we facilitate fun and engaging team building activities designed to enhance teamwork, team culture, leadership, communication and collaboration. 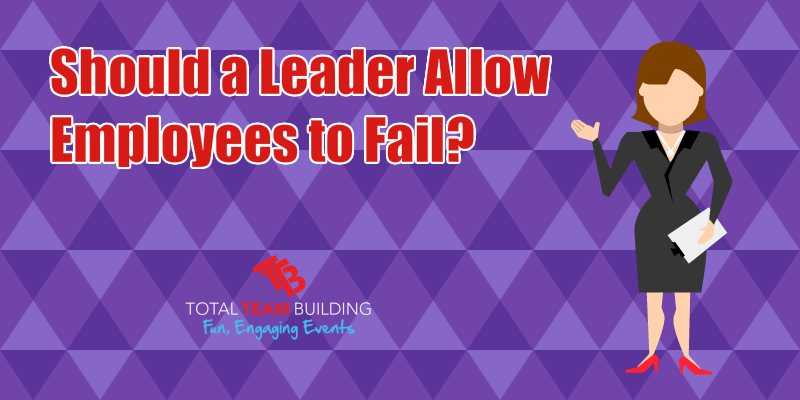 For more information about how Total Team Building can help you and your learn from failure contact us today.